Admit it that being on the water is simply the best and relaxing experience is ever. Nothing can compare to floating on water on a Saturday afternoon, not having to worry about anything. So, for this type of experience, the first thing that you need is a kayak or a boat. On top of that, you need an even better-trolling motor battery that will give you the performance at your highest potential. In fact, no matter how good of a boat you may have, the trolling motor battery is the most crucial part of your water vessel. Now, if you’re looking forward to fishing, you really need the best trolling motor battery. What works best for a casual fisher might not be the best for a dedicated angler, and that’s why you really need to dig into the details of the trolling motor battery. Hence, we will walk you through a number of trolling motor battery, while entailing some of its pros and cons. Trying to choose the best trolling motor battery may seem like a trivial matter, but it goes without saying that there are a lot of things to look at. Consider the different types and its uses and how long it will last, and you are almost in the midst of a challenge. We would recommend you to go through each and every single one of them that we have listed in this article, as they are all no less than the other. They might differ in what you need them for and your preferences. So, our first pick for this list would be the Mighty Max ML35-12, which is an excellent pick for a fantastic price. Perhaps, it’s the most affordable one with what it has to offer currently in the market. This battery is 100% spill-proof – something that is highly important when you are choosing batteries. That’s because when you are trying to decide where to mount your battery and in what orientation you should set it in, you will really need to think about whether it’s spill-proof or not. For minimal use and smaller applications, this batter is a way to go for. The ML35-12 performs best when used for kayak trolling motors as it’s less powerful and smaller. Let us be straight, this battery is rated at a 35Ah, which means that it is capable of running 5 amps for 7 hours. The amp-hour rating is not an issue for kayaks. It is totally long-lasting and has a deep discharge recover. The dimensions of the battery seem to be quite favorable. It’s about 7.68 x 5.16 x 7.13 inches (LxBxH). It weighs about 23 pounds and uses the solar panel to charge it. This makes the battery nice and compact. The Mighty Max ML35-12 is very reliable. It has a 30-day refund policy for which you don’t need to be worried about if it’s going to suit you well. Talk about confidence? Mighty Max ML35-12 truly understands it. Overall, it’s an excellent choice for those who are looking for a trolling motor battery under 50 pounds, not anything monstrous. It’s perfect for solo kayakers. It has been the crowd favorite for many consumers actually recommend this battery. The Optima 8016-103 is engineered in such a way that the machine is way more durable, useful and sturdy overall. The battery is a 55Ah rated unit that comes with 750 cold cranking amps. It is both a starting and trolling battery. You don’t need to worry about whether it will fit into your boat or kayak. It’s suitable for all types of medium to large sized boats that covers it for a decent amount of time. Precisely, its dimensions are 10×6.75×7.8 inches and weigh about 43 pounds. Is that a bit too much? Well, considering its performance, it’s entirely fair! What’s worth highlighting is that Optima used their patented technology called SpiralCell on this particular model. This is what delivers more power and reasonably outperforms conventional flat plate batteries. Moreover, Optima boasts about how they have made efficient use of pure lead and lead oxide for their spiraled lead plates. Do you know what this means? It means that the battery is much more reliable, durable and consistent in its performance. The good thing is that this 12-volt automated glass mat batter does not require much maintenance. As we already mentioned, it’s a high-end battery, which might be a little bit expensive but it totally worth it. Usually, Optima’s batteries are very reliable and well-crafted. If you straight away want to jump into buying a product without doing much research, this is one battery that you could entirely rely on. The DieHard 38217 Advanced Gold AGM Battery is specially designed for off-road vehicles, watercraft, and vehicles that go through intense vibration during its use. With more than 50 years of innovation, this powerful battery is 20 times more vibration protectant than other similar models. In a way, this is also useful in extending the battery performance over time as it controls the vibration and thus provides twice the life cycle of regular batteries. The DieHard 38217 Advanced Gold AGM Battery is a sophisticated electronic equipment. It has the fantastic heat-sealed and tamper-resistant construction that enhances electronic suspension to protect its internal components. In tune with that, the battery is absolutely spill proof. That’s because the optimized power full-frame negative and positive plates safeguard life robbing electrical shorts. Before we forget, let us tell you that this battery is recommended for vehicles with massive loading capacity and complex mechanism. All credit goes to its amazing delivery and its ability to maintain sufficient charge. This superior quality AGM battery design withstands almost any temperature or situation. In addition, the battery doesn’t require much maintenance and is mountable in practically any position. All of that surely makes it an ideal battery for your vehicle. The VMAXTANKS VMAX V35-857 is a quick pick for most anglers when they can’t decide from choosing a new one because of its great versatility and the price that it comes with. Besides, it has a unique physical and chemical structure of its plates. Among the ones that we’ve reviewed so far, the VMAX goes an extra mile with its AGM battery because of its refinement process. You never have to worry about this battery’s spill-proof technology. Moreover, it’s entirely maintenance free. This battery is specifically well-known for the lead-tin design that makes it far better than the lead-calcium batteries. It also makes use of a thicker plate, which substantially makes the batter more durable. Anywise, the battery is designed to last longer than usual batteries. The dimensions are about 7.7 x 5 x 6.1 inches with a weight of 25 pounds. Compared to its size and weight, the battery has a surprising resistance to shocks and vibrations. Although some consumers have reportedly complained regarding the battery is slightly more cumbersome. Speaking of the amp-hour rating, this is a 12-volt battery at a rating of 35Ah. That’s why it’s regarded as the perfect battery for kayaks and small boats. Best of all, VMAXTANKS VMAX V35-857 advertised its trolling motor with 18 – 40 pounds of thrust. Consumers have said that it can go up to 50 pounds of thrust comfortably. The VMAXTANKS VMAX V35-857 is something that will never disappoint you. Smaller things have greater ability, and this battery is clear evidence of that. The good thing is it won’t dry up your wallet. It’s cheap, effective and durable and most importantly, it’s an excellent powerful battery for a reasonably small to medium sized boat. Another one of those high performing batteries from Optima. Installing one of these Optima BlueTop AGM Batteries in your boat would give you excellent running time and better recharges than you’d get from a traditional battery. The AGM (absorbent glass mat) battery requires little to no maintenance at all. Hence, it reasonably charges pretty quickly, fully charging about in 6 – 12 hours. It’s the ideal marine battery for your boat with an extensive electronic system, trolling motors, that also works well as an RV battery. In addition to that, the Optima BlueTop AGM Battery has an outstanding vibration resistance with efficient power delivery and faster recharge time. So, you don’t need to worry about your battery charging anymore. With 800 cold cranking amps and 1000 marine cranking amps, this battery gives a dominant start. Just like most Optima products, the BlueTop 8006-006 34M has an extremely durable plastic outer. The reason why that’s a plus point is that it protects the battery from bumps, damage, and scrapes. Therefore, it’s said to be 15 times more resistant to vibrations than other batteries in the same production line. Needless to say, it makes up to be the best long-term battery for your boat or other vehicles. Weighing about 38.4 pounds, the Optima BlueTop 8006-006 is relatively lighter than the way it mounts easily in anywhere on your boat. It’s about 10 inches long and just a little bit under 8 inches tall, making it the perfect mid-sized battery, which doesn’t take up any extra space. Finally, this battery comes with an excellent warranty. Optima BlueTop 8006-006 promises to remain defect-free for at least 24 months after purchase – this is more like a claim that the manufacturers feel confident about their product. Like the VMAXTANKS VMAX V35-857, this one is also a 12-volt battery that is perfect for use with a trolling motor. Nonetheless, it makes a great battery for general use like powering 12v consumer electronic systems or onboard 12v systems. Again, the AGM technology provides a seamless design that doesn’t need any extra maintenance through its lifetime. However, since it’s a deep cycling battery, make sure that you are using it alongside a starter battery in order to crank your engines or equipment. 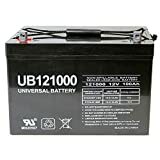 The Universal UB121000-45978 weighs about 64 pounds, and measure over 12 inches from one end to another, this battery is pretty heavy. But do keep it in mind that this battery is no joke; it’s tough and can mount on almost anywhere in your boat. Once you’re done using, store it discreetly in your home or garage, and no one can even find it. As tough as the battery is, it’s equally valid. It discharges only 3% of its full charge every month when standing, which means that you don’t need to charge it if it was fully loaded when you stored it. From its physical standpoint, the exterior of the battery is acid proof along with a very thick plastic body that will get you through any situation. Overall, if you buy this, consider yourself a winner already! You can never go wrong by using it as a power source for a trolling motor or an electronic system. The VMAX MR127 is packed with nothing but power. And when we say control, it’s not just the starting power; it’s also about consistent power that delivers excellent performance. In short, the good thing about this battery is that it recharges quickly, it’s easy to mount, and it’s built to survive through bumps and extreme vibrations. All thanks to the AGM technology for the battery being 100% maintenance-free. Just like the VMAXTANKS VMAX V35-857, this one also charges fast. Many anglers actually prefer this battery because it makes this a convenient option for their boat. Of course, it’s vibration resistant and highly durable with the solid external plastic case that it comes with. So, it protects the battery from any vibration damage and knocks that may occur. One of the most significant advantages that we think about this battery is its sturdiness. It is extremely strong and rugged. Among all the other, this one surely has the most robust plastic bodies that we’ve observed on a commercial battery. Therefore, the battery surely has excellent durability. On top of that, the thick, sturdy plastic is also extremely vibration resistant. It is constructed to mount inside the most compatible Group 27 battery box, which is in fact, straightforward to mount inside a boat. And if you’re thinking about how much it weighs, it’s only about 67 pounds. 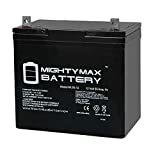 Overall, the VMAX MR127 is an impressive deep cycle battery that performs well, charges rapidly and has the sturdiest, durable exterior. If you are looking for something great, we hope you won’t mind its price. Other than that, the battery comes with a 30-day refund policy. Any manufacturer defects will be replaced in under 12 months from the date of purchase. So, this is worth a serious look. Another one of that’s worth looking at batteries from Might Max. This ML55-12 SLA is something that provides worry-free service to you for years after years. Although you might complain that it’s a bit too heavy, but overall, the unit makes up for it. The battery is about 9 x 5.43 x 9 inches and weighs reasonably about 38.58 pounds. That’s not all that bad, right? Okay, moving on, it is a 12-volt battery with AGM technology. Hence, you can practice a stress-free experience and never have to worry about cleaning it. Just like other Might Max batteries, this one also comes with a 30-days refund policy and a one-year defection warranty. Even though many users have stated that the cycle life is not so long as compared to its competitors’ it still resists a good 24 months without any service interruption. We think that this battery is pretty decent to the price it has to offer. Primarily, it is at 55Ah, which we have observed to give a power of 30 pounds thrust trolling motor at medium levels of speed for about 6 hours. Therefore, it’s perfect to work with medium-sized kayaks, but it might be a bit too big for smaller boats. Regardless, this power-packed battery is all you need for an ultimate boating experience. And guess what, it comes for a great price, too! Almost anything and everything gets better when it’s solar powered. Why? That’s because even if you forget to recharge your battery, it would still work just fine. The WindyNation is one such great battery. This heavy-duty deep cycle AGM sealed lead acid battery works perfectly fine because of its heavy-duty plates that are designed for repetitive, deep discharges. You can never go wrong with the WindyNation because it’s merely excellent. Moreover, this is ideal for all types of off-grip powers. Whether it’s RV’s, Solar systems, UPS or other portable tools, it will surely work just fine. The non-spill-able, sealed design allows for the battery to be used literally in any types of situations. This non-spill-able design allows it to be used in any power equipment such as golf carts, inverters, airports and of course, off-shore marines. Like most others, the WindyNation is also a 12-volt battery designed for deep cycle. The pure virgin lead allows for a meagre discharge rate and ultimate power storage. So, in every way, this battery is a win-win. With that being said, this battery runs at a 100Ah at a 10-hour rating that also comes with a 1-year warranty. Sounds good, right? Perhaps, the best you could ever have! If you are looking to invest in a good battery, this is definitely the one you should go for. As the name suggests, this battery is a dual-purpose marine battery that has a voltage power of 12-volts. This battery is fantastic because of its amazing deep cycle capability and outstanding starting power. It’s about 13 x 6 x 9 inches with a weight of about 84 pounds. 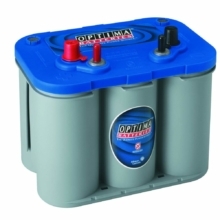 The ODYSSEY Batteries TROLLING Thunder Marine Dual-Purpose Battery is mainly built for commercial purposes. With this size and weight, it definitely is designed for heavy-duty uses. The pure lead plates are packed with the AGM design that makes the battery the most versatile marine batteries of all time. The sealed design along with the recombinant technology enables the gas to mix and form water within the battery, without needing to refill. And of course, the tin-plated brass is resistant enough to corrosion. The external container is tight with robust cell connections that protect the internal cell from being damaged due to intense vibrations. The Odyssey has 40% more reserve capacity than other conventional batteries of similar size. Moreover, this battery is flameproof. The massive starting power and the heavy-duty capacity brings back to how durable the battery is! In fact, it’s one of the bets AGM dual-purpose marine batteries if you compare it to others. Plus, the Odyssey 31-PC2150S has a dual-purpose ability. It is able to handle the most difficult tasks under the harshest weather and still be running fine. The only thing we don’t like about this battery is its charging issue. In addition, the battery needs proper maintenance to run correctly. It could also be quite expensive, which doesn’t make it a good choice for those who are looking for budget-friendly options. It’s the ideal options for professionals. Deep cycle batteries come with a rating of amp hours. This is a unit that measures the total amount of charge inside a battery, which enables a single amp of current to discharge over a time of one hour. Simply put, it’s the number of amp hours that determine how much electricity the battery can store. This is seriously one of the most important metrics that you should look in a deep cycle battery as this is what ensures how long the battery can power a trolling motor. It’s not available for dual-purpose batteries, which makes it difficult to calculate the total amount of time that the batter can power. However, just so you know, small batteries usually measure 25 – 40 Ah, while larger deep cycle batteries can reach up to 100 Ah. In reality, there are no perfect amount of amp hours in a trolling motor battery. The higher the ampere-hours will be, it would mean that the battery can power your trolling motor for longer. Nearly all deep cycle batteries are manufactured in 12-volts. This means that you will need a few batteries to power a 24-volt trolling motor. Before you go on buying a battery, you need to be aware of your motor’s power system and its demands. The reason why it’s important to look at the weight of a trolling motor battery is that you need to check if it’s going to fit in your vehicle or watercraft’s weight limit. Moreover, the heavier it will be, the more troublesome it would be for you to set it up. Most batteries these days weigh somewhere between 20 – 50 pounds. The lower the weight of your battery, the better it is for you to maneuver around. Then again, it depends on your capacity too. Most kayakers or anglers prefer to have a battery below 30 pounds. Modern AGM batteries don’t require much maintenance, which makes them a convenient choice for professionals. They are way easier to own than those traditional, heavy-maintenance batteries. They even make a safer option to use, whether you are looking to mount it side up or upside down. Some of them are also constructed with an extra thick plastic casing that insulates and protects the battery from extreme vibrations. This, along with AGM technology make great features to extend a battery’s lifespan to save you from having to replace your battery annually. Cold cranking amps (CCA) is the number of amps that your battery will release during the first 30 seconds of starting up at 0-degree Fahrenheit. This is mainly important for stating power batteries that need a massive amount of energy for a short period of time. You won’t need to look for CCA into a trolling motor batter unless your battery has two main functions; starting your electrical equipment and keep it running for hours. Why You Need a Trolling Motor Battery? Environmentally friendly: Whether you know it or not, but trolling motor batteries are very much environmentally friendly. They run seamlessly, and that’s why they are very quiet to the environment around them. They do not create any interference with other boaters, flora or fauna. You would be very fortunate to own one of these batteries. Easy to Maneuver: Trolling motor batteries are very lightweight and easy to install. Within a very small space, you can mount it in your boat, kayak or other off-road vehicles. This motor battery gives you better maneuverability. They are available in a number of pressure levels, and it meets all the environmental situation that may arise. Great for you to steer the boat that helps you to control it very efficiently. Q1: Which is the appropriate size of solar panel that I need for my trolling motor battery? Answer: We wouldn’t suggest solar for recharging in a trolling application, only battery maintenance. The amps included are rather substantial. For support, one 2.5-watts solar maintainer per profound cycle battery works or for a 24-volt system, a 10-watt unbreakable solar panel also works. Large solar arrays on the roof of boathouses work as well, but it’s more complex, and the cost is even more significant. Q2: Where do I store my batteries? Answer: You really need to be aware of your batteries. Don’t mix the different types and separate the old ones from the new ones. Always keep the batteries that are not in use in a dark, and slightly below room temperature condition. The place should be cold and dry, but don’t overdo the coldness because it will just end up destroying the batteries. Q3: Is trolling motor batteries bad? Answer: The best way to tell if your battery cells have spoilt or not is to check the specific gravity. This specifically works for wet lead batteries. Basically, the specific gravity helps in determining the concentration of the acid in the water. So, if one cell has +/- 30 kg/m3 of the other cell, then the battery is of no use. For other types, you can only pull out the multimeter. It’s going to show you all that you need to know. Replace the batteries as soon as you can in order to avoid further damaging your trolling motor. Q4: What does it mean when they say that trolling motor batteries are maintenance-free? Shouldn’t I clean it? Answer: Clean? Not really. But maintain? Before we proceed, let us tell you that clean and maintain are two different things when it comes to trolling motor battery. Yes, you do need to maintain your trolling motor battery. We have observed that many great batteries simply spoil because of lack of care. You can clean your battery if you see that it has started showing signs of eroding. Keep dirt and other grime off your battery. Wet lead acid batteries should be refilled with distilled water whenever required, and must be kept under supervision. Use tools such as hydrometer to test the concentration of acidic substances. You also need to take care whether the battery acid is overflowing or not. These batteries do require a lot of labor in terms of maintenance. Though we have mostly reviewed out AGM batteries as completely maintenance free, there are some necessary steps that you have to take to protect your batteries. Watch its charge. Never overcharge the battery because it could spoil its function very smoothly. Keep an eye on how much energy you draw from the battery. Even if your battery is capable of delivering 5 amps for 10 hours, you shouldn’t practice to drain it dry. Make it up to the point of using only 75% of your charge at most. It might sound weird or superstitious, but it does end up doubling the life of some batteries. Never mix old batteries with new ones, never mix the battery types either. Charge the batteries immediately after you are done using it – if you leave them discharged for too long, it will decrease their performance and longevity. Although most batteries come with a maintenance-free label, you should still check the wet-cell battery fluids levels and top-off whenever needed. Do keep an eye on the terminal connectors every now and then for potential signs of corrosion. If by in case, there appear to be corrosions, clean it with a paste of water and baking soda. Always store batteries in cool and dry places, especially in the off-season and maintain a trickle charge. Have you ever spoken to a fisher about their experience? They must have told you that patience and silence is the key to successful angling or fishing. The harsh truth is that the sound of motors, continuous vibrations and sputtering engines that scares the fishes off. The quiet approach is what the most fishers prefer, and that’s what helps them catching bigger fishes. To get the best catches, there has to be pin-drop silence, no vibrations or no exhaust fumes. Therefore, a smooth and easy electric powered trolling motor is all you need. If you are a severe fisher, you will need the best trolling motor. The one that would not produce any noise or thrust from the trolling motor. With a trolling motor mounted on your boat, fishing becomes so much more comfortable and enjoyable. Despite the trolling motor being a small-sized motor, it’s damn powerful and can be used in a number of trolling spots, be it a lake, large dam, slow-flowing river or other places. The silent motor doesn’t create any noise so you can enjoy a pleasant boating experience around the lake. Moreover, it allows for an efficient fishing session without creating any vibration or noise. Also, trolling motors are made out of thick plastics and materials like stainless steel that’s resistant to almost any type of corrosion. Thanks to the quiet motors that helps fishers catch more fishes in no time. Troll motors also make it possible to steer the boat easily rather than oaring the boat, which is more robust and less productive. In a word, it’s a life savior. Smooth, relentless, silent, versatile and flexible, the trolling motor will change your fishing experience forever. Let us know which trolling motor you opted for. We’d love to know!